Black Desert Online Remastered - The Beautiful MMORPG? Every self-respected MMORPG fan has surely heard of Black Desert Online before. Although it isn’t a free-to-play game in North America and Europe, it is low-priced and there is no shortage of offers to get it for free or close. For example, if you register through the link in the video description, you’re helping us and getting access to a 7-day free trial. So, Black Desert Online recently got remastered in a new update and this has turned one of the most beautiful MMORPGs ever into THE most beautiful one. There is no way to discuss this game without mentioning the stunning classes and the rich and exciting world that you will get to explore. To put it bluntly, this is one of the most fantastic virtual trips to medieval times that you will ever partake. With tons of fantasy elements thrown in the mix, of course. But more on this later. Black Desert Online features 16 classes, quite an impressive number considering that this is a fairly new game. Classes are extremely varied and offer a nice mix of melee, ranged and magic-based characters, with anything for everyone. The new Drieghan expansion should be hitting the game right about now and brings a new and large mountainous area with over 300 new quests, more nodes to conquer and a new dragon world boss called Garmoth. Drieghan is a land of dragons and ancestral home of dwarves, so it’s a great thing that you’ll be able to craft a new weapon called Dragon Slayer. Another class, the long-awaited Archer, previously known as the Male Ranger, is coming sometime later. 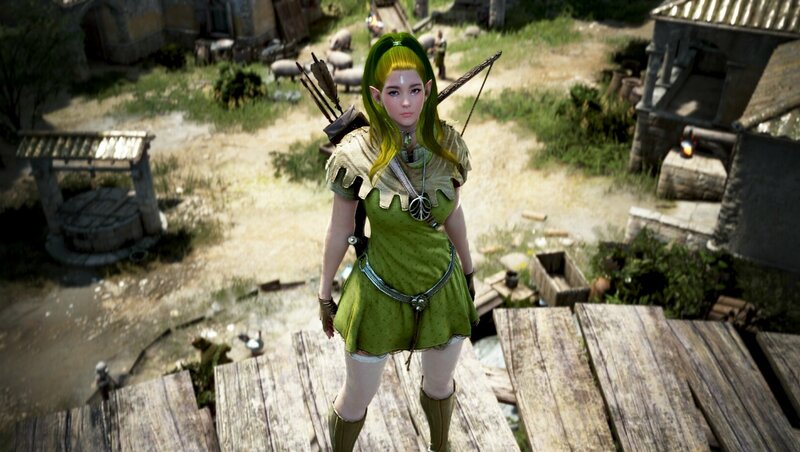 The Female Ranger was one of the original launch classes in Black Desert and clearly won the attention of a lot of players since then.The Archer relies on his crossbow as well as on an assortment of magic skills to fight his opponents. This new update is one more in a long line of frequent releases, as developer Pearl Abyss and Kakao Games consistently deliver additional content to Black Desert Online. This already is an incredibly vast and complex game, and every other month it grows bigger with a new expansion, either a new class, a new region, or the Remaster – it’s not often that we see a recent MMORPG getting a visual overhaul, particularly one that was already clearly a step above the competition. Apart from the stunning graphics, Black Desert Online has a few other significant things in its favor. The character creation system is a thing of beauty and we have already mentioned several times just how detailed it is. Offering every kind of slider, hairstyles and colors, you can also customize every limb of your character’s body, creating a unique hero that may even resemble a celebrity, if you so wish – here’s a refresher for you, just in case. If you devote your time to it, hours will go by and you may eventually create a stunning character that becomes the envy of other players, even without resorting to the impressive costumes that are available for purchase in the Pearl Shop. 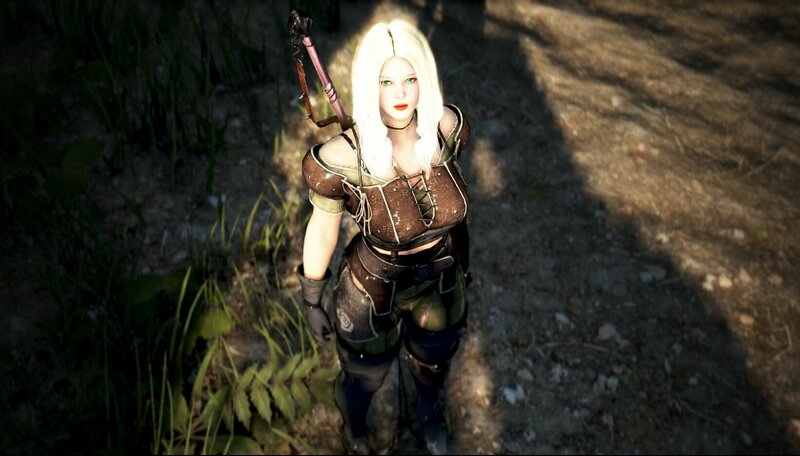 But beauty is only skin deep and Black Desert Online needed something other to keep players around. That other thing is the unrivaled real-time action combat, in our opinion the new standard that other action MMORPGs will be measured to. The pace at which your character moves, the swift reactions, the impressive amount of skills that will result in endless combos are without comparison, making tab targeting combat feel like a thing of the past. Combat is, in one word, fun. In two words, extremely addictive. 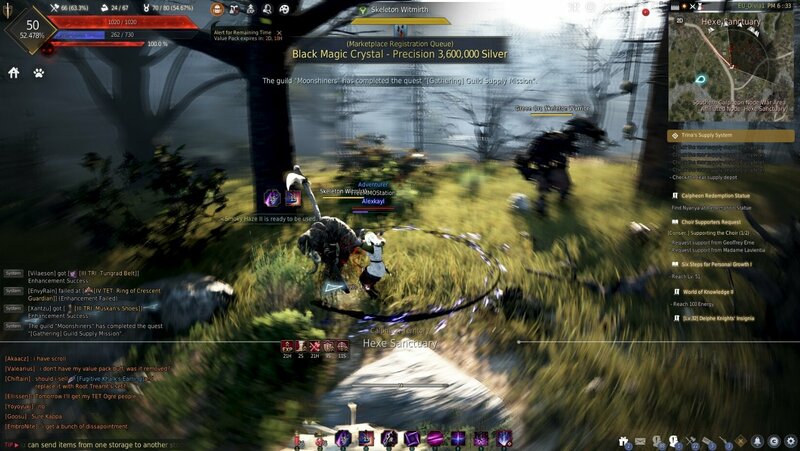 The way that your character slices and dices through mobs is incredibly satisfying and even makes the usual grind a tolerable, rewarding task. Obviously, Black Desert Online requires you to grind to go places. The PvE will take you through countless quests, with everyone and their mom asking you for help, but your experience bar will only move when you grind monsters. Make no mistake; you must go through the quests to regularly unlock new regions and new, more rewarding enemies, but even if it wasn’t so, the world of Black Desert is so compelling, so rich, even with an epic scale at places that you would be a fool not to want to explore it in detail. The knowledge system is another mechanic that just makes sense. In a brave new world, your wisdom is limited to what you’ve experienced firsthand, so it’s only logical that you need to discover new places and talk to new people to learn about them. The same goes for the creatures that you face, with health bars hidden until you gain some battle experience, and the monsters becoming slightly easier as you fight them for a longer period. It’s clever design. You will eventually notice that this is an MMORPG without dungeons or raids in the traditional sense. However, there are world bosses and the open world is so rich that the trade-off seems perfectly legit. You won’t lack things to do, either. You can count with all the usual distractions to keep you busy, the life skills as they are called. Gathering, cooking, fishing, mixing, milking (yes, you can milk cows), taming wild horses, trading, sailing… Black Desert Online has an imposing depth to it, with layers and layers of complexity that will take you months, maybe years to master. As a side note, we’ve seen one player with nearly 2,000 hours jokingly saying: “I just finished the tutorial!” The economy system is so complex, so extensive that it almost feels like a second game, with node management, workers for hire, an in-depth housing system… There is no shortage of things to do besides questing and fighting. Things will get real when you reach level 50. This is when you need to diversify your approach to the game and truly invest in your character as to not become a pawn when it comes to PvP. Soon you will be staring the endgame in the eyes and you’d better have a character that is ready to take on other players, or you’re screwed. We can’t properly judge this part as we didn’t spend that much time above level 50, but it was enough to get a feel for the competitive, ruthless side of Black Desert. And die a few times. There isn’t much more to say about Black Desert Online without going into boring technical jargon that other, expert players are better at. It may not be the perfect game because there is no such thing, but it is a remarkable MMORPG that dares to break boundaries with its unmatched action combat, amazing character creation system and surprising depth. One final note goes to the Remaster, which turned a beautiful game into a stunning, almost lifelike world where you feel the need to stop and enjoy the scenery. The artistic level is extraordinary, with massive cities and fortresses that would put Game of Thrones to shame. Even the smallest mill or abandoned church feels hand-crafted, carefully designed to feel unique, something that is impressive considering the scope of Black Desert. Take a stroll through the majestic Calpheon and you can be sure that your jaw will drop, but pick it up as soon as you can because Valencia is waiting for you somewhere out there. Black Desert Online is a game for a long, long time, and the grind almost feels justified by the beautiful new sights that you will get to see. Give it a try for free for seven days and see for yourself.